Hello and welcome to our Year 4 page. We will use this space to keep you informed on the exciting activities and learning that will be happening throughout the year for your children. Throughout this half term we will be looking at the Celts and the story of Finn McCaul. We will be focussing on the Celts through our English, History and Art. In Science we will be focussing on sound, looking at how sound travels through the air and how instruments are used to create sounds of different texture, tone and pitch. Our first half term is a very important time for our maths where we begin learning new concepts in place value. We will take a detailed look into the place value of 4 digit numbers and will work to understand place value through comparing, ordering and finding more of less than a given number. 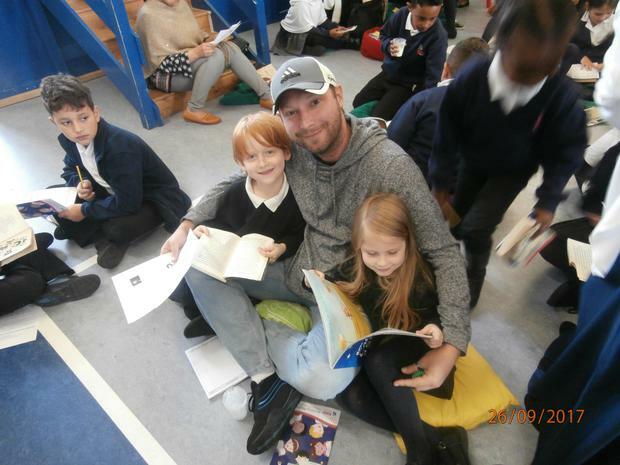 Year 4 is a very important year for your children and we invite you to join us for our curriculum meeting and pop ins on the 20th September at 3.30pm in the bottom hall. We will use this time to explain the curriculum development for your children throughout the year and to answer any questions you may have. We look forward to working with your children this year and watching them grow as learners and individuals. 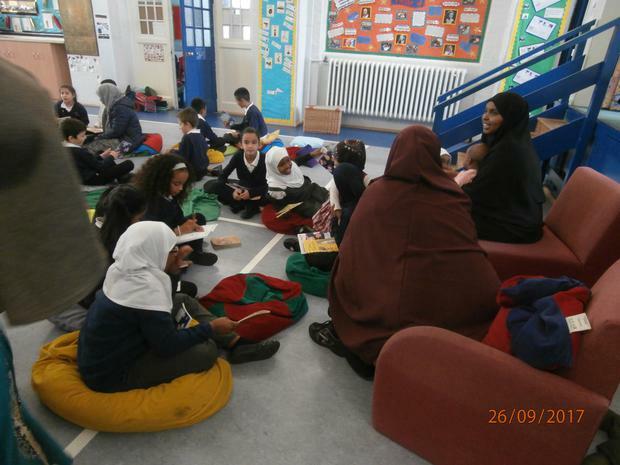 In RE this half term we are looking at Islam. We began by studying patterns in the faith and reflecting on other religious places in which we may have seen uses of patterns. Following on from this, the children learnt about Allah’s role as a provider and creator and the different names used for him. Next, we discussed the teachings of the Quran and how it can be used as guidance for Muslims on how to be a good person. In science this half term we are learning about the body’s digestive system. We began by discussing the importance each food group and their benefits to the body. 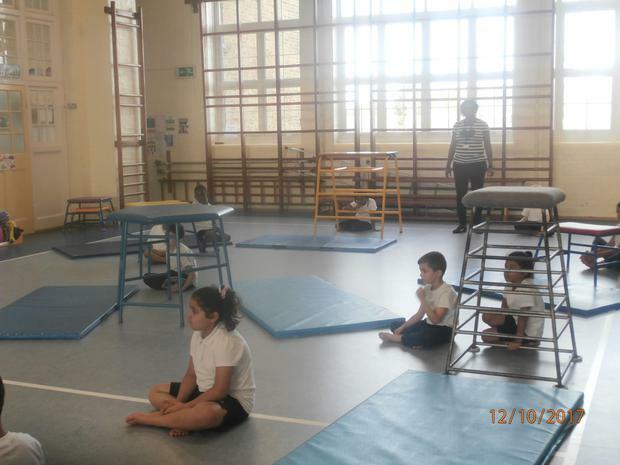 The children were introduced to the term ‘balanced diet’ and its meaning. 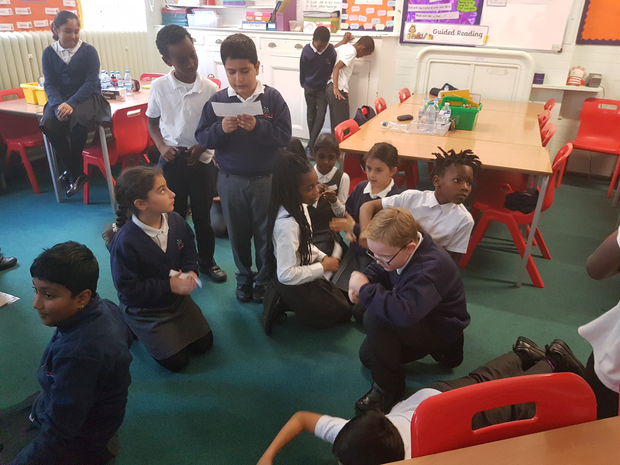 Progressing into the topic, Year 4 learnt the names of the major parts of the digestive system and the role of each part. Things got messy as we used crackers, bananas, orange juice, bags and even a pair of tights to recreate the human digestive system. The children are really enjoying this topic and are looking forward to future lessons which focus on teeth. 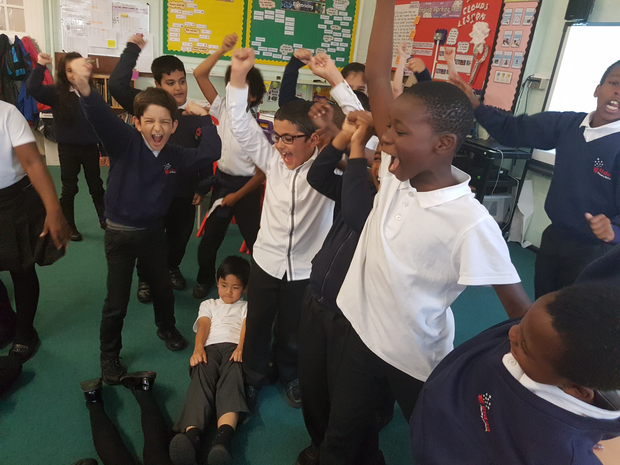 This half term, Year 4 are looking at the heroic tale of Beowulf in their writing. In the true Anglo-Saxon style, the children created Kennings poems and we shared a selection of them together out in the sun. Following on from this, the children described one of the main settings for Beowulf, Heorot, the grand residence of King Hrothgar. In future weeks, the children will be writing a comparative character description on the fearless, brave Beowulf and the grotesque, monstrous Grendel. Braving the rain and cold, Year 4 marched down to Edmonton Green station to catch several trains to Central London. Our destination? The Victoria and Albert museum. 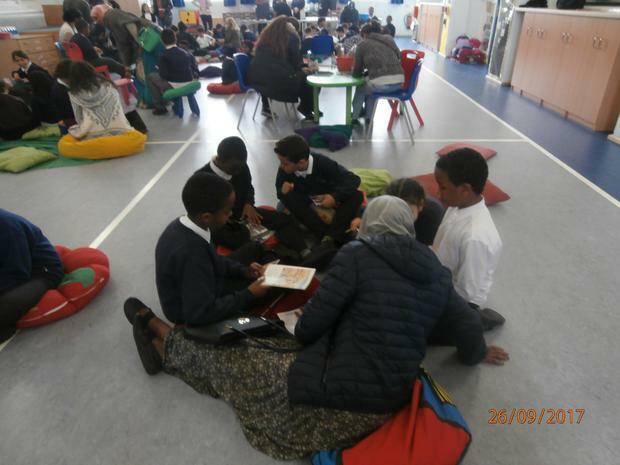 The children had a chance to see several exhibitions, including one dedicated to patterns in Islam, which really helped with our RE focus. The main reason for our trip was the Anglo-Saxon workshop in which we were taken on a historical journey by one of the workshop leaders. The children were told stories of the Anglo-Saxons way of life and got to see authentic Anglo-Saxons items such as brooches and weapons. 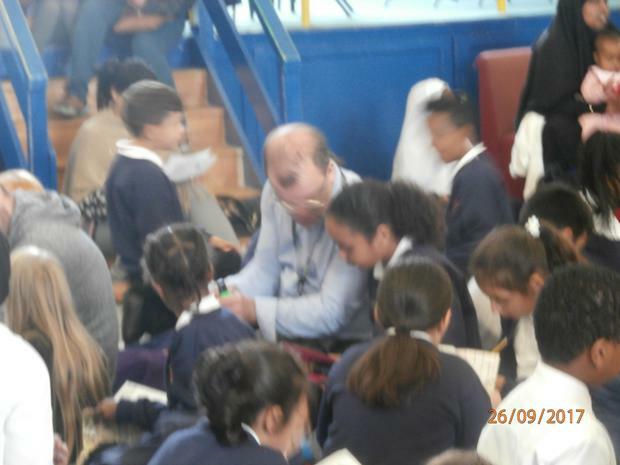 We all had a fantastic time on the trip and our newly gained information will certainly help us in our writing tasks! In R.E this half term we have been learning about Sikhism. We have focussed on the teachings of Guru Nanak and how special he is to Sikhs. These lessons have helped us understand just how important it is to treat everyone with equality and respect. We look forward to learning more about Sikhism and how we can link its teachings to other major religions around the world. In English this half term our focus is linked to our topic of raging rivers. We began by looking at the journey of a river and were introduced to a lot of tricky new words such as confluence and estuary! In addition, the children learnt about the upper, middle and lower course of a river and the three main processes that occur: erosion, transportation and deposition. With all this knowledge and technical vocabulary in our minds, we used it to produce our own explanation text on the journey of a river. 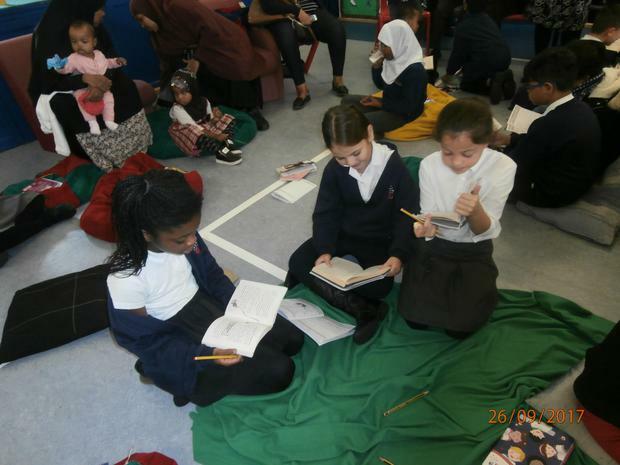 There was much excitement when World Book Day arrived as Year 4 was awash with iconic characters from an array of famous books. We began the week by looking at the focus book of the half term, ‘A River’s dream’. 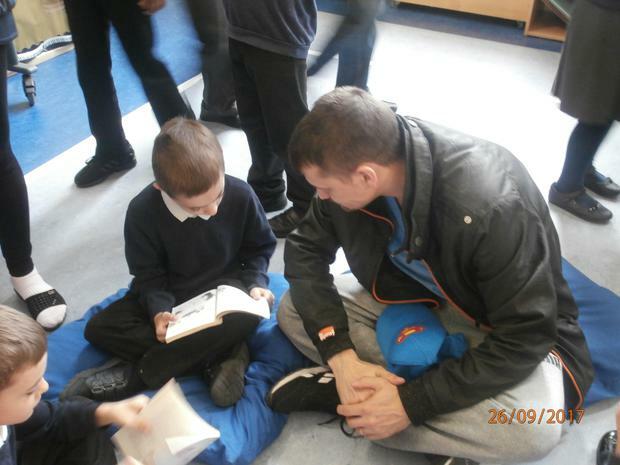 We read the fascinating story of Mark, a young boy with a fever, who received a present from Uncle Scott. The present, a small metal box, seemed to possess magic as it transformed Mark’s ordinary street into a river! We read up until the point in the text where Mark begins to fish on the river and captures a…. After reading this section of the book, Year 4 got creative by writing and designing their own books based on the text but retold in their own words. We had some fantastic creations, filled with wonderful illustrations and cliff-hangers! 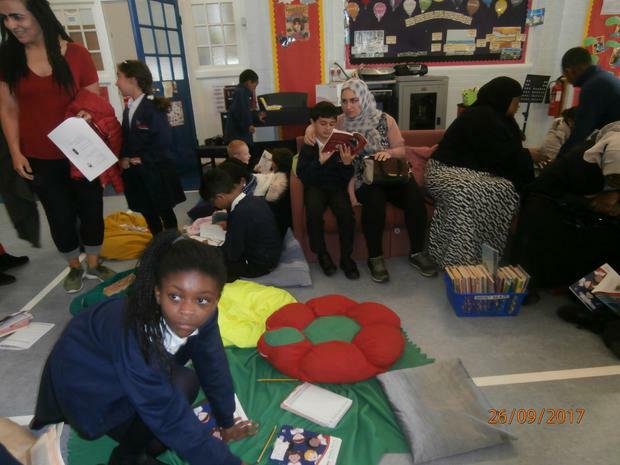 At the end of book week, we read the books we had created to children in Year 2, it was a great experience for all involved. Wow, what a sight! 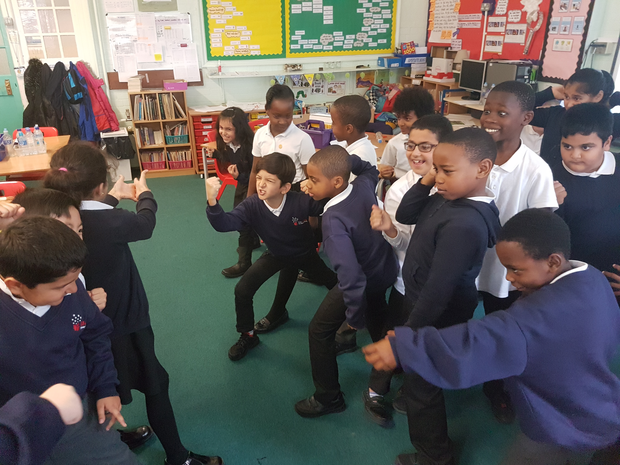 Eldon Primary school was invaded and occupied by swarms of fierce Romans and courageous Celts as Year 4 hosted Roman day. 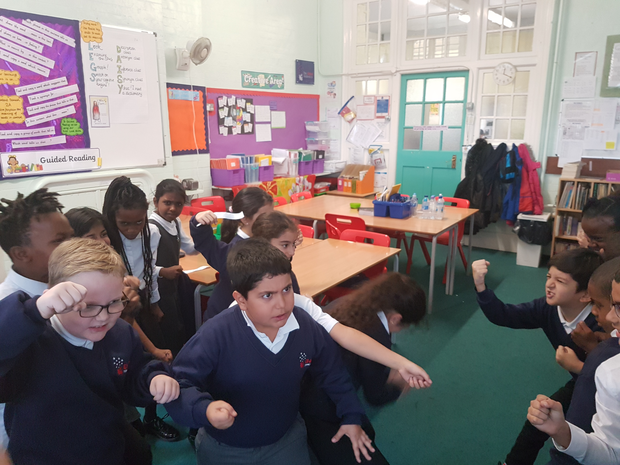 Our fantastically dressed warriors completed a range of Roman themed activities throughout the day, all led by different class teachers. Using simple ingredients, we created an authentic Roman meal consisting of biscuit and stew. 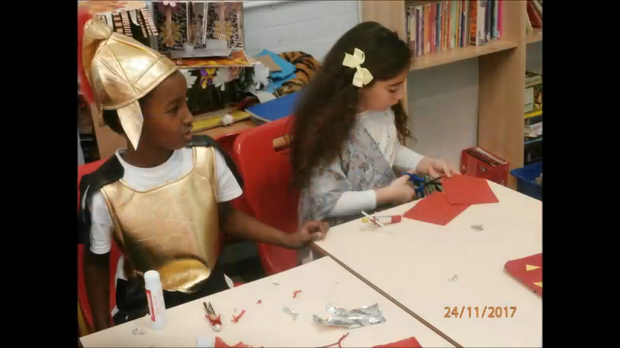 Getting creative, the children used various materials to create a Roman shield and a miniature Roman soldier. 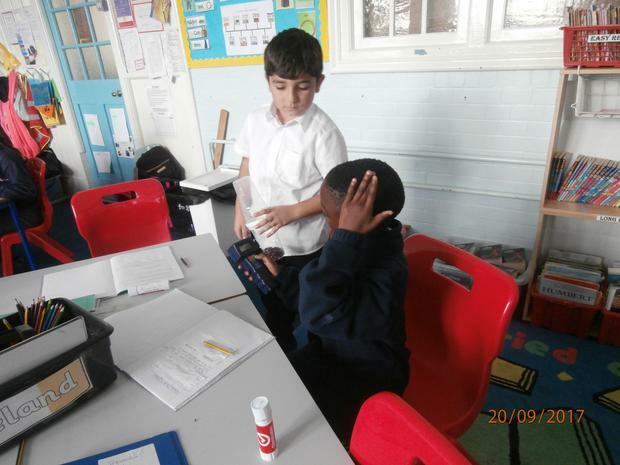 We learnt how to read and interpret Roman numerals, which will be helpful for when we look at them in maths. 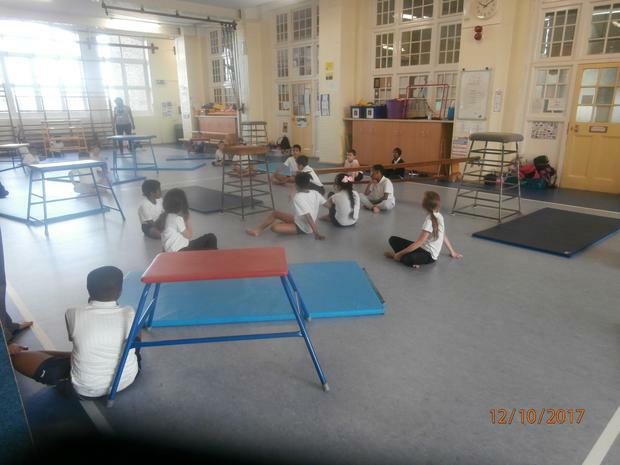 Transforming our hall into a battleground, we learnt about Roman formations and even got to act them out as a class! 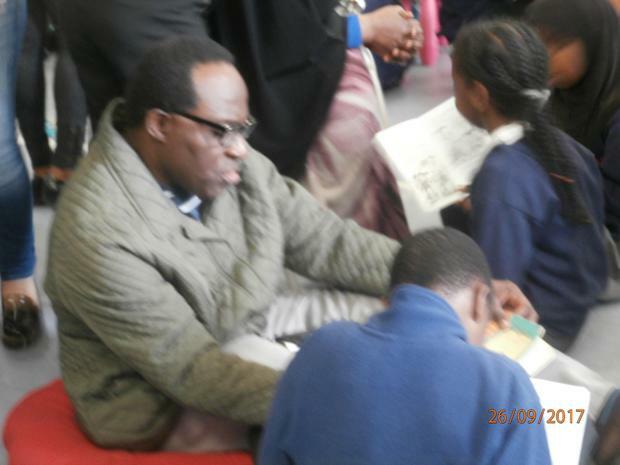 The day itself was engaging, fun and educational for everyone. We as staff would like to say a massive thank you to the parents and carers who helped make this day a success by sending their children to school in such wonderful costumes. 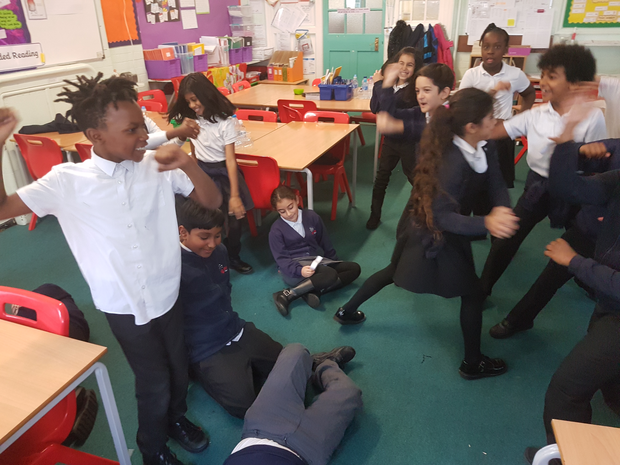 Last week in Literacy, Year 4 gained further understanding of Boudica’s life through drama. 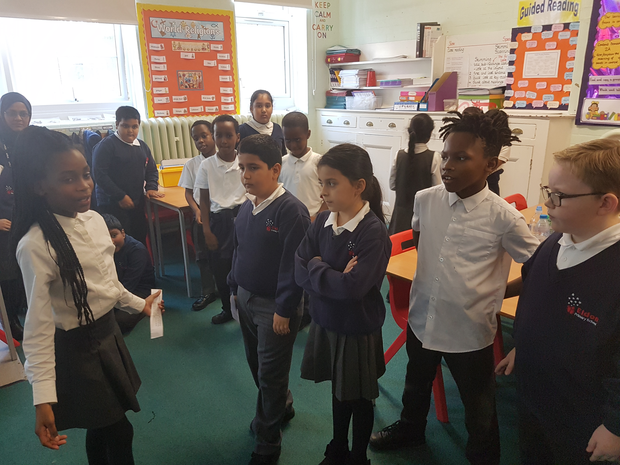 Children were placed in groups to perform key events from Boudica’s early life, rebellion and battles. 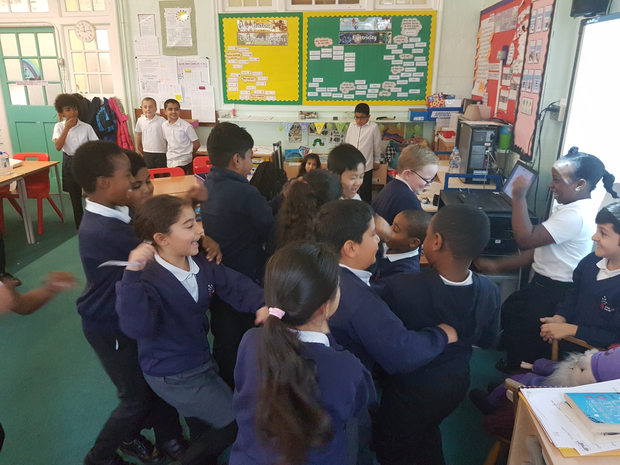 The children really enjoyed this lesson and it has really helped their preparation for their biography writing that will take place this week! This half term we are looking at superheroes. Starting off, we researched famous superheroes and the teachers were delighted to discover just how many experts on the topic there were in each class. 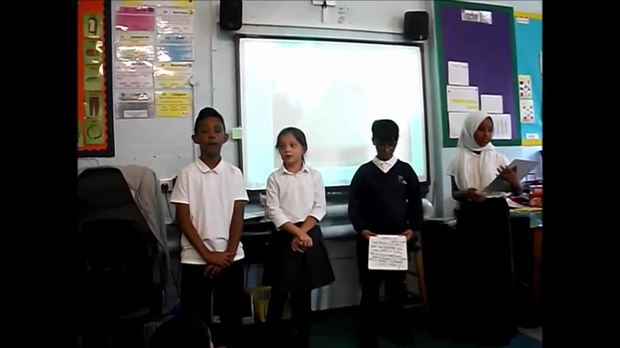 Following on from this, the teachers of Year 4 delivered an assembly about their personal heroes, to help the children understand the difference between a superhero and a hero. This led to some fantastic discussions back in class in which the children got to share their personal heroes. Getting creative, we moved onto designing our very own superheroes and even made miniature models of them using dolly pegs! Next up the children looked at newspaper articles and learnt about their key features. We used this knowledge to create a newspaper article on a video clip of a superhero. To conclude the topic, staff and pupils alike are all looking forward to superhero day, which is happening in early February. In maths we have been busy completing our multiplication times tables under test conditions. Some children have been able to complete their speed test in an amazing 42 seconds! We have also been busy investigating rounding decimals to the nearest whole number. For example 99.1 is rounded down to 99 as the number in the tenths column is 1. On the other hand, 105.6 is rounded up to 106 as the number in the tenths column is 6. We discussed how we could apply this maths in real life. 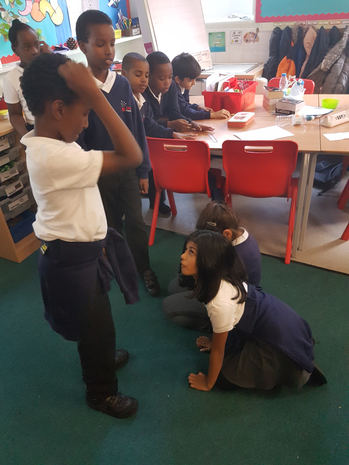 Some children stated that "We could use the skill of rounding to help us estimate how much money we will spend in the shops." 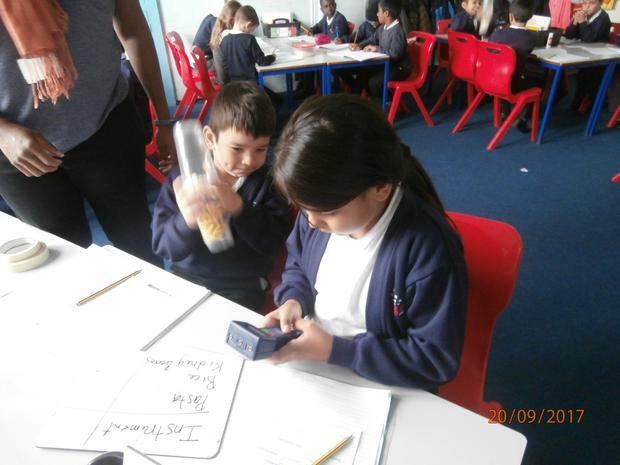 Others also decided that, "We could use the skill of rounding to estimate how much money we have in our wallets." 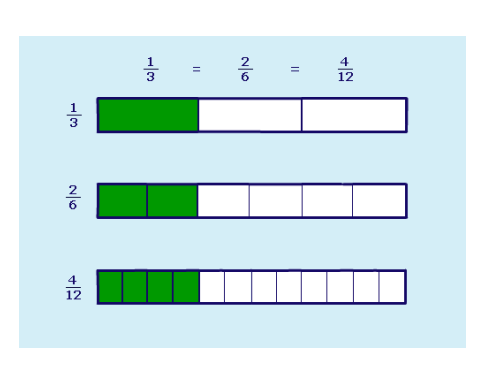 We have also been looking at equivalent fractions. Did you know that equivalent fractions are fractions that look different but show exactly the same amount? Children noted that 1/4 is the same as 2/8 and drew diagrams to explain what they had noticed. Our upcoming lessons will include adding and subtracting fractions with the same denominator and solving word problems involving fractions. 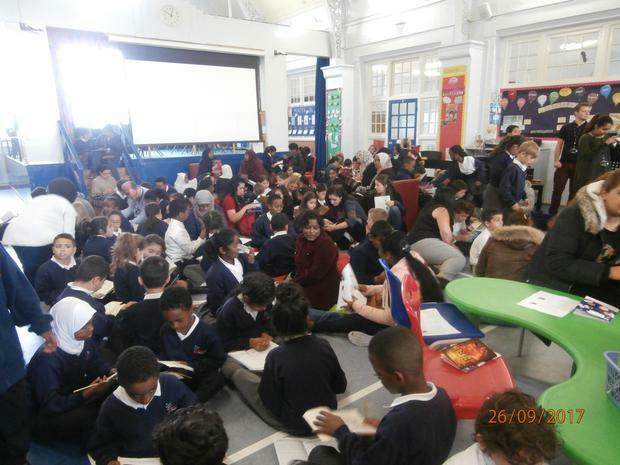 Finally, we have been celebrating the large number of Year 4 children who sign into Mathletics daily! Well done to these individuals who have earned their certificates, ​Remember, the magic score is 1000 points in order to earn your certificate. For this half term we will be focussing on Judaism. We will begin by looking at the Jewish Sukkah before moving onto creating our very own! Following on from this we will be looking at Jewish Synagogues and the features of this place of worship. We will end our RE topic by looking at the Ten Commandments and exploring opportunities to discuss our local community within RE. It should be a very exciting half term. In RE this half term we are studying Christianity. The children started off by learning about the Baptism ceremony and how it relates to the idea of community. We managed, through discussion, to find similarities between Christianity and other major religions and noted that all promote the idea of a welcoming and strong community. Next up was a trip to a local church, this gave the children a real world experience to help build on their learning about its key features. We are thoroughly enjoying learning about Christianity and look forward to continuing our learning on major religions of the world throughout next half term. During this half term art was linked to our topic of the Celts. We started off the half term by learning about the materials that the Celts used to make certain objects. We also discovered which countries Celtic artefacts had been found in. Building on this, we attempted to replicate intricate Celtic patterns that had been found on a range of objects. We achieved this by using sketching techniques and focusing solely on the pattern as opposed to the object itself. The children were excited to discover that at the end of the half term they would be using the patterns they’d practised to make and decorate their own Celtic clay cross. Just before that, we carefully planned our designs on a paper cross template. The creating lesson was extremely fun (and messy! ), the children produced some wonderfully creative and detailed crosses. This gave the children a real insight into how skilled and patient Celt artists were. 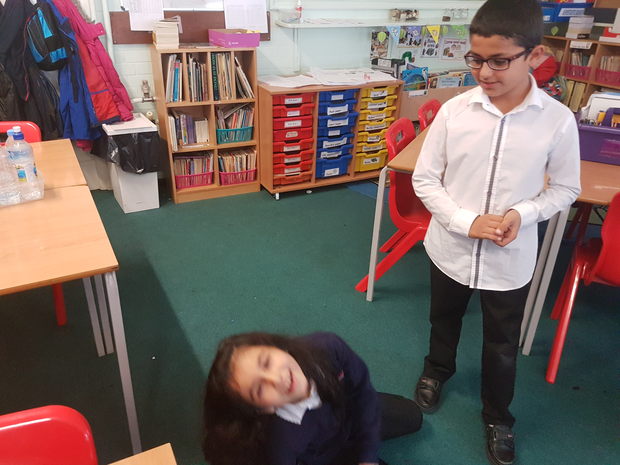 This half term in R.E we have been learning about Hinduism. We have learnt about how Hindu’s believe in many different Gods and that God is in everyone and everything. We used this idea to create a mind map about the different people that we are. We also discovered the meaning of the various components of a Puja tray, which Hindu’s use during prayer. We learnt of the story of Ganesh and used this knowledge to reflect on times when we have had to overcome obstacles in our life. We thoroughly enjoyed this topic and we are all looking forward to exploring the other major religions throughout the academic year! 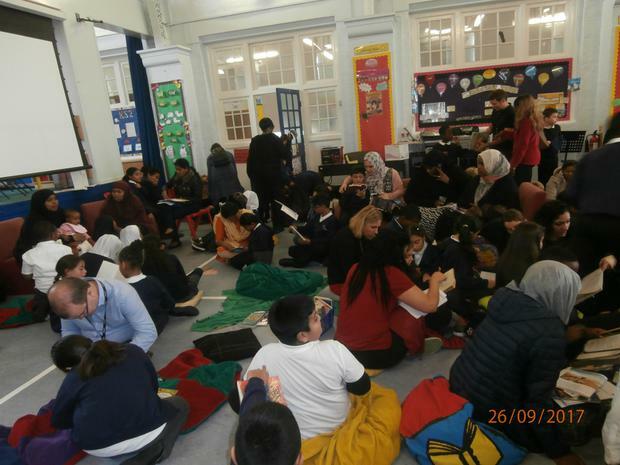 This half term we hosted Year 3 and 4 parents for ‘sprawl in the hall’. 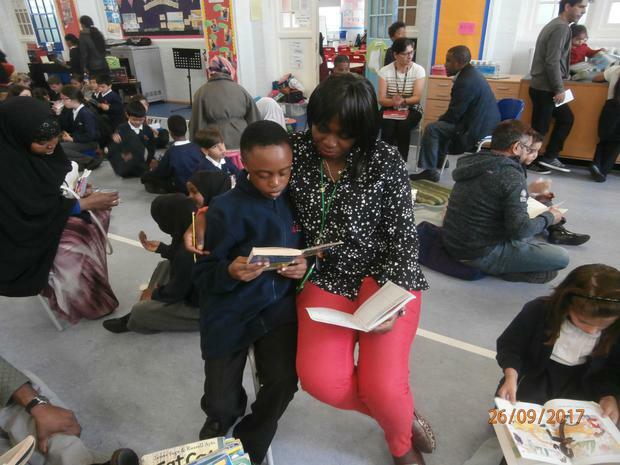 The hall was transformed and filled with books, excited children and proud parents (let’s not also forget complimentary cookies and milk!). 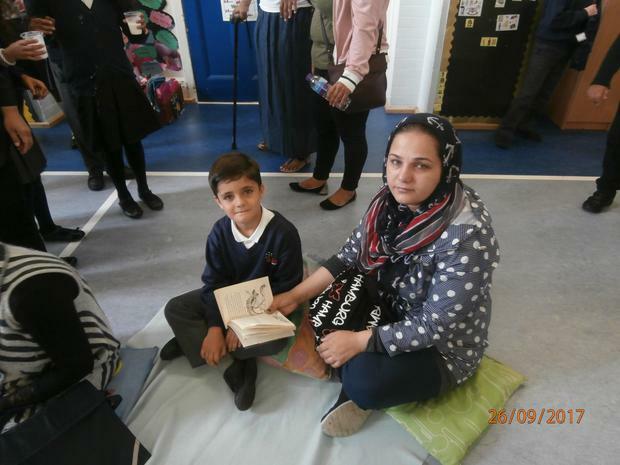 This event provided a great chance for the children to demonstrate to parents the amazing progress they have been making with their reading skills. 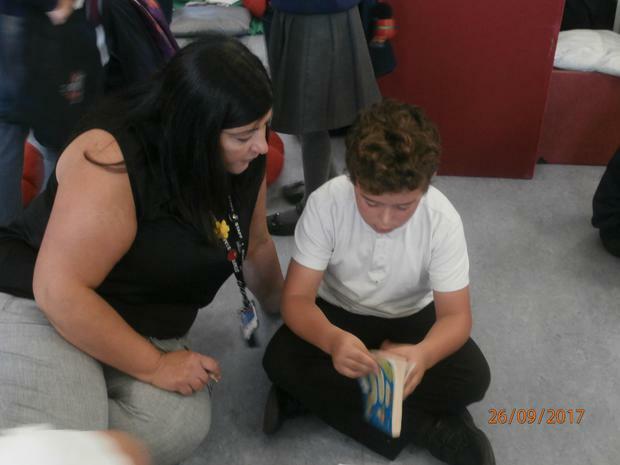 It also allowed parents to gain a better understanding of how to support their child in completing their reading log. 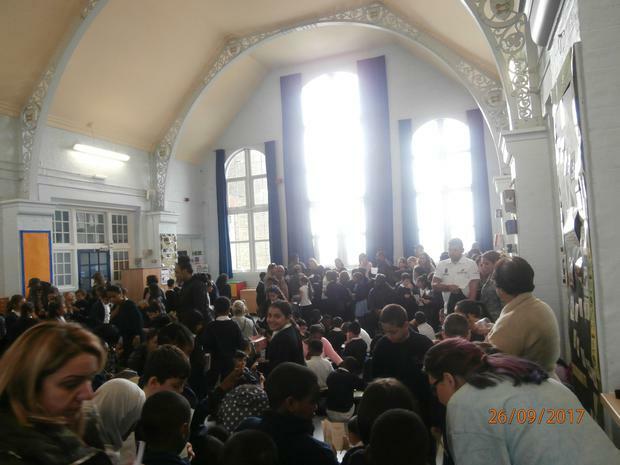 We had an amazing turnout and wish to say a big thank you to everyone who managed to come along. We hope that we can do something similar again soon! This half term in science we have been looking at sound. We started off by discussing different ways we could describe a sound, concentrating on using key vocabulary such as volume and pitch. 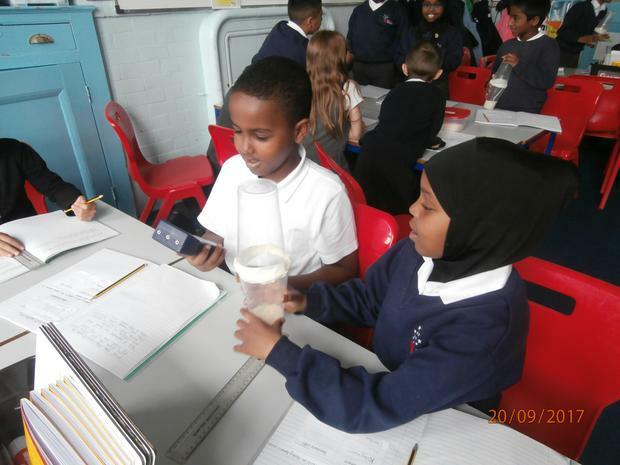 From there we explored how sound is produced through experiments involving musical instruments, tuning forks and even our own homemade food shakers! We are already looking forward to our topic next term, which is going to be electricity. If you wish to explore our topics further outside of school, there are loads of free websites which offer easy to follow, yet exciting science experiments. 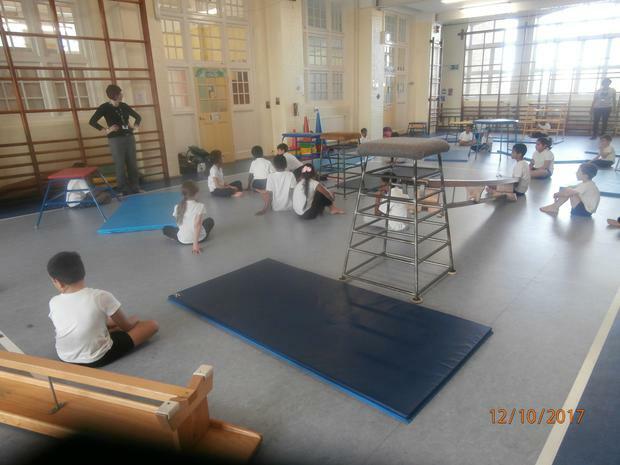 This week has been a very busy one for pupils in Year 4. 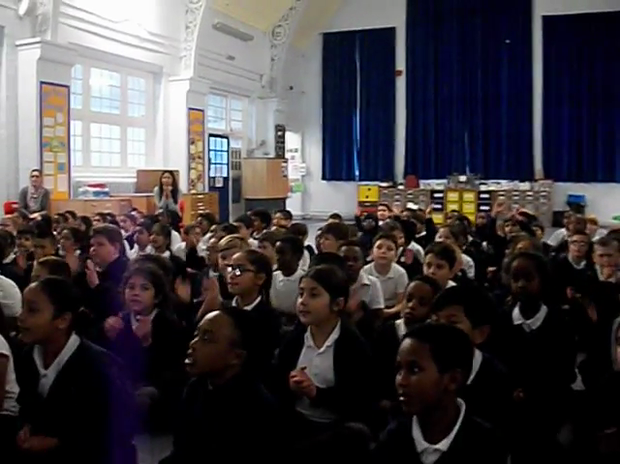 We have started the year by looking at a short animated clip called ‘a cloudy lesson’. We have looked at the clip in depth in English and have broken the video down into small parts. We began by writing short elements of dialogue using speech bubbles and have gone on to use these pieces of speech in our writing of a short narrative. We have worked hard to include necessary features such as appropriate adjectives, imperative verbs, adverbs, and even the correct use of speech marks. It has been a great short topic and we are really looking forward to moving on to studying Finn McCaul, which we will begin next week. Please find the video we have been working with below. It would be great if you could discuss it with your child too to help support their learning!